College cafeteria food is about to get a bit tougher to take  literally. This fall thousands of students will have to navigate their university dining halls without one crucial feature: the cafeteria tray. From the University of California at Santa Cruz to Virginia Tech, cafeteria trays are disappearing, enabling universities and food-service companies to reduce food waste, lower energy costs and make college campuses more environmentally sustainable. The reasoning goes like this: when students are allowed to use trays, they tend to roam around the cafeteria grabbing food with abandon until space on the tray runs out. If you remove their trays, you make it impossible for them to carry a surplus of dishes, and they will make their selections more carefully and be satisfied with less food overall. That saves on food. Further, getting rid of trays means dishwashers have less to wash. That saves on water and energy. "Dining facilities on campuses take up to five times more water, five times more energy, five times more waste per square foot than the dorm," says Monica Zimmer, a spokeswoman for Sodexo, a food-service company that serves approximately 600 U.S. campuses. Exactly how much greener can a tray-banned campus get? According to a July report released by Aramark Higher Education Food Services, a dining company serving about 500 schools nationwide, students waste 25% to 30% less food when they aren't carrying a tray, and dining halls save a third- to a half-gallon of wash water per tray, on average. The University of Maine at Farmington went trayless in February 2007, reporting an overall reduction in food waste of 65,000 pounds and 288,288 gallons of water conserved. Meanwhile, Georgia Tech  which implemented a no-tray program in response to the drought of 2007  estimated that the university saved 3,000 gallons of water per day by giving up the trays. The push for conservation doesn't end with trays. George Mason University in Fairfax, Va., is at the fore of the sustainable-dining-hall campaign. In September, it will open Southside, a $10 million 40,000-sq.-ft., 95%-sustainable dining hall. Southside isn't a cafeteria; it's a full-service food court with takeout meals and indoor and outdoor seating  and no trays. There are several food stations to choose from  including the "Spaghettaboutit" pizza-and-pasta station and the "After All" dessert bar  and each offers its own silverware, dishes and seating area. 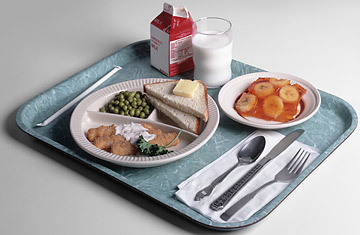 "Without the tray, it just doesn't give you that 'I need to go everywhere and fill up my tray and then sit down' option," says Denise Ammaccapane, resident district manager at George Mason. "[Instead you're] saying, 'I like this item on the menu today. That's what I'm going to have.' "
Southside will also use eco-friendly chemical cleaners, biodegradable to-go containers, and bulk sugar and ketchup dispensers instead of disposable packets. Kitchen waste oil will be filtered and reused before being donated to biodiesel-fuel depots. Even the leftover food on students' plates will do double-duty. Food scraps and biodegradable napkins will be washed into a contraption called the pulper, where they will get, well, pulped. The resulting slurry will be pumped to the first-floor extractor, in which it is dehydrated and turned into a material resembling sawdust. The remaining "food dust" is then dumped into a biodegradable trash bag to be consolidated in a trash compactor, then hauled to a commercial facility that sends the scraps to a composting yard. "That's how we get to as close to 0% waste as possible," says Zimmer of Sodexo, which provides George Mason's dining services. Indeed, doing away with lunch trays is just one piece of a grander scheme to make dining halls and campuses carbon neutral. Schools have begun buying organic and locally grown foods, for example, or sometimes growing food right on campus. At the University of Maryland, there's a tomato and herb garden atop one of the dining facilities; it was planted to generate interest in local and sustainable farming, and is watered in part using runoff from refrigerator condensation. The green message gets broadcast in a variety of ways: at Claremont-McKenna College in California, students erected a giant Pyramid of Waste  a stack of Styrofoam to-go containers  designed to encourage students to eat in. "Fundamentally, I think consumers have to understand that some of the responsibility lies with them to create less waste," says Helene York, director of Bon Appétit Management, a company that has been dedicated to sustainable food initiatives at colleges nationwide since 1999. "If we create less waste, we don't even have to consider a need for back-end technologies [like the pulper]." To York, eliminating cafeteria trays is just one tactic to address the issue of food waste; reducing the size of serving dishes and portions, she says, might be just as effective. As part of its Low Carbon Diet program, launched in April, Bon Appétit has challenged all 80 of its accounts to reduce food waste by 25% by April 2010. The company provides the educational material and lets its colleges decide how it should be implemented. Not every school can afford to build sustainable eateries from scratch, and not every school can even get rid of trays. Many colleges run up against common infrastructural and cultural barriers  such as cafeteria washroom rollers that can't easily accommodate plates that aren't on trays, or campus residents who just can't get on board with a tray-free lunch. At some schools, like Middlebury in Vermont, trays were simply removed, and administrators let the grumbling subside. But at most other colleges, the movement has been grounded in community discussion on sustainability concepts  so students and faculty are on board with the idea. Says Chris Stemen, senior director of sustainability and environmental stewardship at Aramark: "Part of why you're [at college] is for the learning environment  new mindset, new habits, new ideas."